Large beach umbrellas are a great way to be sun smart on the beach, but they're also cumbersome and awkward to carry. For a more compact alternative, look to this travel-size sun umbrella from Coolibar. I must stress that this is strictly a sun umbrella. A few customers have complained that the flimsy fiberglass spokes cave in at the slightest wind, so it's never going to help you in a storm. But that isn't its purpose. It's intended to keep the sun at bay on steamy summer days, and it does that job well. It's coated with a high tech silvery material to repel UV rays and maximize sun protection. In fact, it's been awarded a UPF 50+ rating by the Skin Cancer Foundation. Its patent double canopy design with a mesh insert also looks to provide optimum ventilation and stability, although as mentioned it won't help you if there's much more than a gentle summer breeze in the air. While large beach umbrellas are a bit difficult to get to the beach, at least once you're there you can plant them in the sand and forget about them. Not so this small umbrella, which you'll need to hold in your hand as long as you want the shade. At least its handle is ergonomically designed with a soft grip to make that carrying a bit more comfortable. Considering its shortcomings $30 seems a little expensive for this travel umbrella, but if you often enjoy spontaneous trips to the beach it might be worth the money. 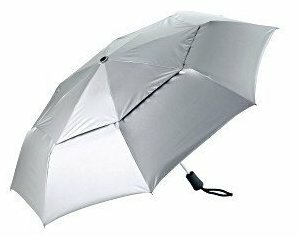 The Sun Grubbies UV Travel Sun Umbrella is a good alternative to this travel umbrella.